Previous PostPrevious Deportment chairs – The original naughty step! 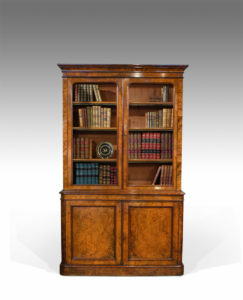 There are two periods of English furniture when walnut was the most popular cabinet timber. The first, known as the ‘Early Walnut’ period dates from 1680 to about 1740, or sometime during the reign of George II, when the newly imported mahogany began to gain in popularity. Much prized by cabinetmakers for its strength and decorative figure, “Juglans Regia” or English walnut, was not in fact native to England, but was introduced from Europe, possibly by the Romans. The “curl” figure is found where branches or roots separate from the main trunk; “burr” walnut, with its distinctive speckled grain, is actually cut from a growth or burr on the side of the tree. These decorative sections would only be used in veneer form, but walnut was also used in the solid for chairs etc. Veneers from this period were laboriously cut by hand, and are typically 1/16th of an inch thick. However, during the 19th century great strides were made in the mechanisation of cabinet making. Marc Isambard Brunel [Isambard Kingdom’s father] built the first steam driven saw mill, and invented a circular saw that could be used to cut veneers thinly and evenly for the first time. He also developed the first hydraulic veneer press. The figured wood cut from burrs and pollards is notoriously difficult to cut and lay: the wild grain which makes it so attractive results in a very delicate, brittle veneer. The new machines enabled the Victorian craftsmen to make the most of these beautiful timbers and ushered in the ‘Second Period’ of English walnut. This beautiful glazed bookcase, dating from about 1850 is typical of this period. Exceptionally finely made, the beautiful walnut veneer is laid onto a mahogany carcase which, 150 years on, shows no sign of warping or splitting! The wood was carefully seasoned, the design carefully thought out, and quality of manufacture extends to the cabinet locks and hinges.